Nike’s upcoming Air Jordan 1 Retro High OG “Origin Story” is a mouthful to say out loud, but it’s a beauty to behold. Moreso when you find out it’s based on Miles Morales’ turn as Spider-Man. 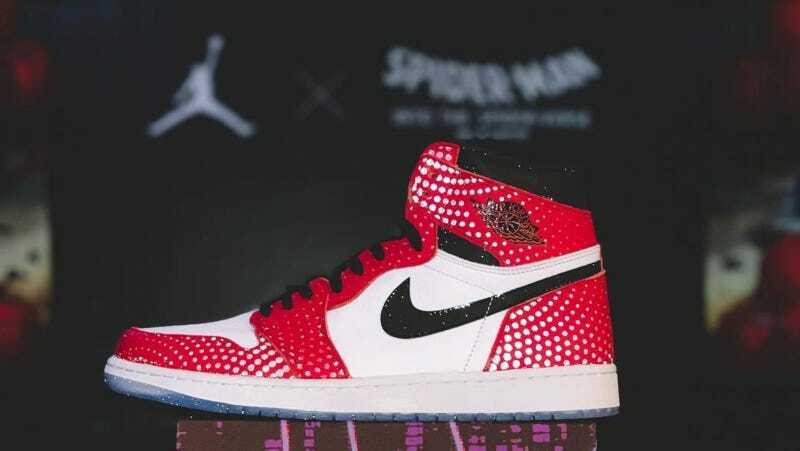 Made to coincide with the release of the animated film Spider-Man: Into The Spider-Verse, they take the Jordan’s classic red/white/black Chicago colourway (like Spider-Man is wearing in the film’s poster) and add some comic book twists, like a finish on the upper to match Spider-Man’s suit, 3M reflective hits, a special Spider-Man box and ice-blue soles. If you want to try and get a pair, Sole Collector reports they launch on December 14.